Take  2x2x8' boards. Cut each to 61", for a total of  2x2x61" pieces. Take  of the remaining 2x2x8' boards. Cut to a 2x2x68" piece. Take the  remaining 2x2x8' boards. Cut to a 2x2x71" piece, for a total of  2x2x71" pieces. Take  of the 4x4x8' boards. Cut from it  4x4x23 ½" pieces. Take the  remaining 4x4x8' boards. Cut from them  32" piece and  19 ½" piece, for a total of  4x4x32" pieces and  4x4x19 ½" pieces. If you will be setting the bench in concrete, instead cut  35 ½" piece and  48" piece, for a total of  4x4x35 ½" pieces and  4x4x48" pieces. Take  of the 2x4x8' boards. Cut  2x4x68" piece and  2x4x26" piece from each one, for a total of  2x4x68" pieces and  2x4x26" pieces. Take  of the remaining 2x4x8' boards. 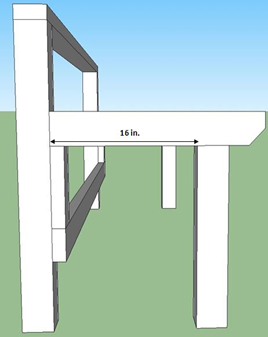 Cut  2x4x71" piece and  2x4x22 ½" piece from each one, for a total of  2x4x71" pieces and  2x4x22 ½" pieces. Take  of the remaining 2x4x8' boards. Cut  2x4x68" piece,  2x4x18" piece, and  2x4x8 ½" piece from each, for a total of  2x4x68" pieces,  2x4x18" pieces, and  2x4x8 ½" pieces. Take the remaining 2x4x8' board. Cut  2x4x71" piece and  2x4x21 ½" piece from it. Take the  4x4x23 ½" pieces that were cut in step 4. 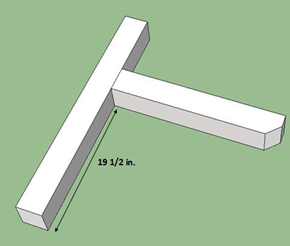 Measure 2" up and 2" in from one corner and cut a 45° angle between the two marks to create  angled armrests. Take the  2x4x18" pieces cut in step 9. Use the miter saw to cut 10° off each side, creating a parallelogram. Take the 2x4x21 ½" piece cut in step 10. Use the miter saw to cut 10° off each side, creating a parallelogram. Take the  2x4x26" pieces cut in step 7. Measure 1 ½" in and 1 ½" up from one corner. Cut a 45° angle on the line connecting the two marks. Take the  2x4x22 ½" pieces cut in step 8. 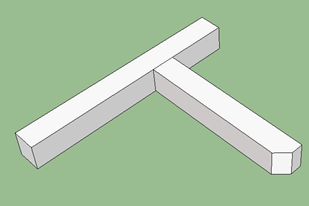 Use the miter saw to cut a 10° angle on one end of the piece. On the other end, measure 1 ½" in and 1 ½" up from one corner. Cut a 45° angle on the line connecting the two marks. 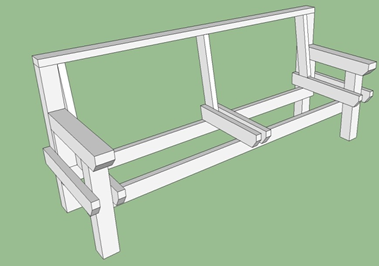 Assemble Legs: Place 4x4x23 ½" arm rest against the 4x4x32" back leg. 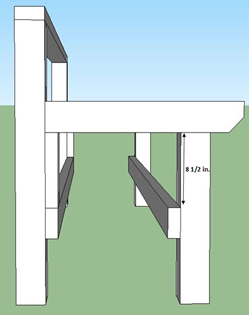 (If you are setting the bench in concrete, you will use the 4x4x48" piece as the back leg.) 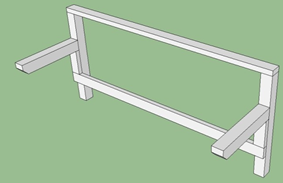 The bottom of the 4x4x23 ½" piece should be 19 ½" from the bottom of the 4x4x32" (If you are setting the bench in concrete, the bottom of the 23 ½" piece will be 35 ½" from the bottom of the 4x4x48" leg). The angled cut should face downward. Attach the two 4x4s by using two 6" galvanized nails. Repeat this step for the second leg. 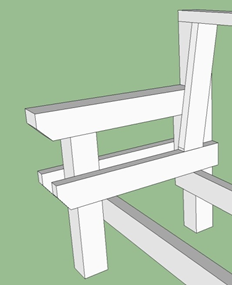 Place the 2x4x8 ½" blocks flush against the bottom of the armrests on both back legs, as shown. Attach with 3 screws per block. 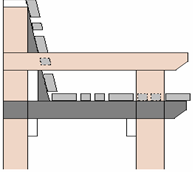 Connect the left and right legs with (2) 2x4x68" beams, one beam flat on top of the legs, and one beam underneath the 2x4x8 ½" blocks. Use three screws at each connection. 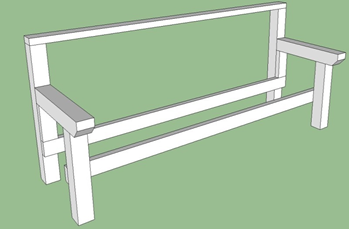 Install the (2) 4x4x19 ½" front legs (If you are concreting the bench, you will use the 4x4x19 ½" legs) underneath the armrests by using 2 nails through the armrests. Leave 16" between the front and back legs. 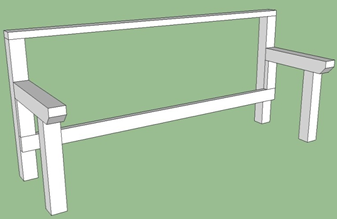 Connect the left and right FRONT legs with (1) 2x4x68" beam. 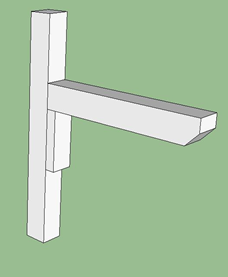 The beam should be 8 ½" down from the armrest and attached to the "inside" of the leg. 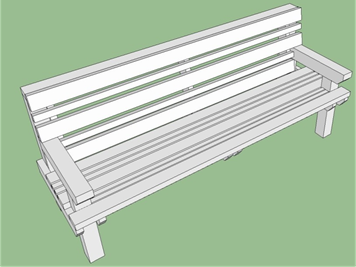 Sandwich the front and back legs with 2x4x26" seat supports (you will need 4 total - 2 for each side of the bench.) They will be attached across the top of the 2x4x68" beams you just attached. Align the supports flush with the back of the back leg (they should overhang in front). Secure with 2 screws into each leg. 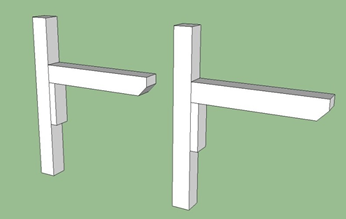 Install the 2x4x18" pieces with angled ends on the inside of the back legs. Install the 2x4x21 ½" center back support in the middle of the two legs. Use two screws through the top brace. 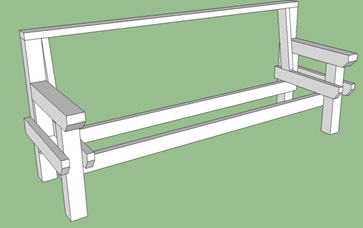 Sandwich the brace with two 2x4x22" ½" pieces. 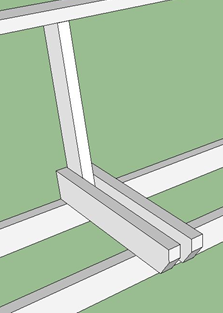 For each piece, use 1 screw directly into the center back support, 1 screw at an angle down into the beam connecting the back legs, and 1 screw down at an angle into the beam connecting the front legs. 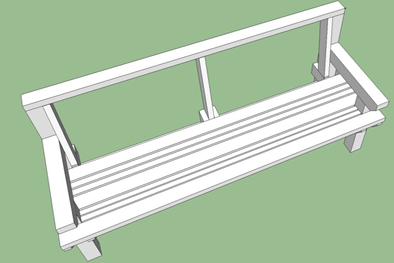 Attach rails along the seat of the bench as shown. Use 2 screws for every 2x4 connection point, and 1 screw for every 2x2 connection point. Pre-drill the screws through the 2x2s so they don't split. Space out the pieces before attaching to make sure everything fits. From back to front the seat will be build with the following pieces in the following order, leaving approximately ½" between each board. Install the remaining rails along the back as shown below. Use 2 screws for every 2x4 connection point, and 1 screw for every 2x2 connection point. Pre-drill the screws through the 2x2s so they don't split. Space out the pieces before attaching to make sure everything fits. There will be about 1" between each board. From top to bottom the back will be build with the following pieces in the following order, leaving approximately 1" between each board. If you are going to set the bench in concrete, dig  holes 6" diameter and 16" deep. 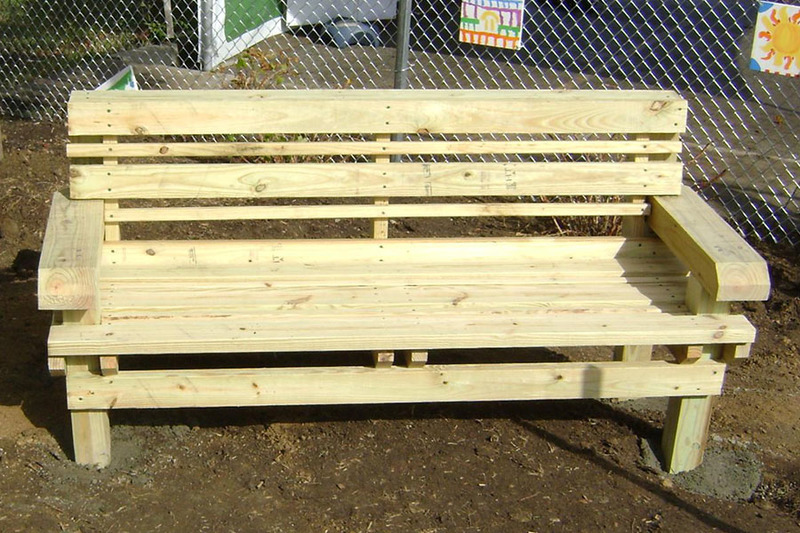 Use a level to keep the bench straight while filling the holes with concrete.